Happy Humpday! I have the piCture pOlish LE Collection to show you today! 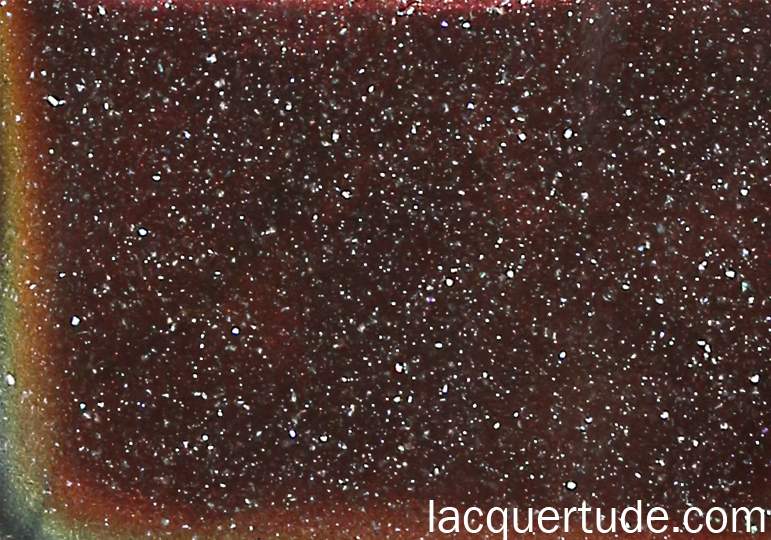 All five shades are absolutely gorgeous, and represent our galaxy and a variety of mind-blowing astronomical phenomena perfectly with their color shifting properties. First, a bit of info about the formula: this collection is meant to be worn layered over a solid base. I tested them and was able to reach full opacity on their own at 2-3 coats depending on the thickness for a softer and more pearly look. However, since the collection is Limited Edition, I’m all for conserving the precious magical liquid so that each bottle can last as long as possible. 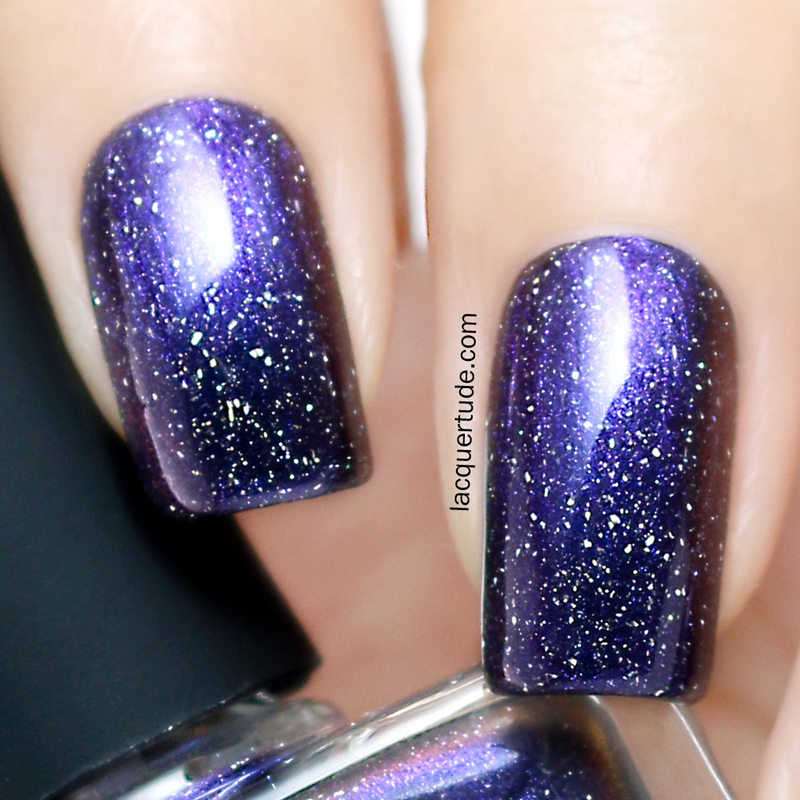 Also, as these shades are meant to mimic the astronomical sky and atmosphere, the colors are at their best over black. Shown in all my swatches here is 1 coat of LE layered over piCture pOlish Black with piCture pOlish Top ‘n Base for base and top coat. 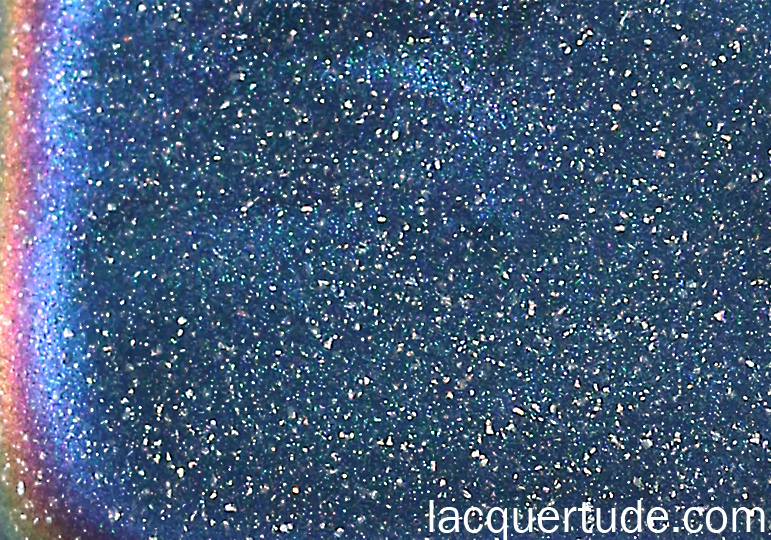 This is a multi-chrome, shifting between blue, green, purple, and magenta pink. 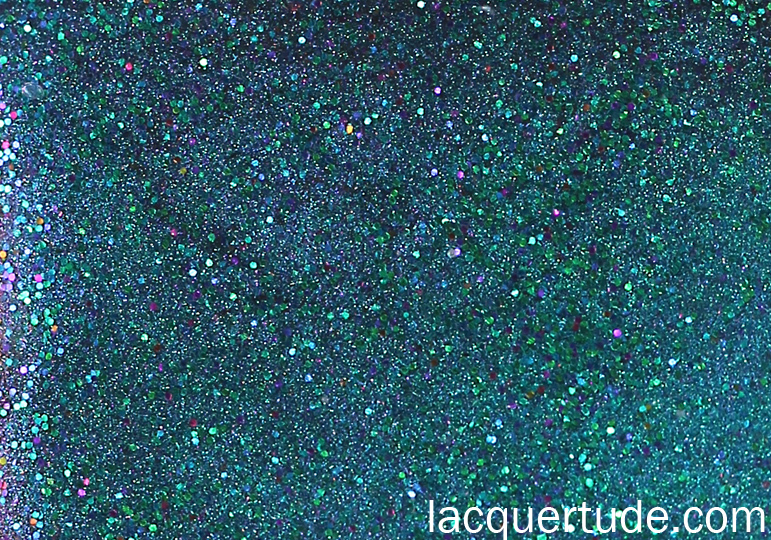 The macro shot shows off the multi-chromatic glitters through out the shade that adds to an extra special effect. Altered State shifts between blue and purple, although I’d say in most lighting, it’s more of a purple beauty. When the light catches just right, you can see flashes of pink along the curve of the nails. 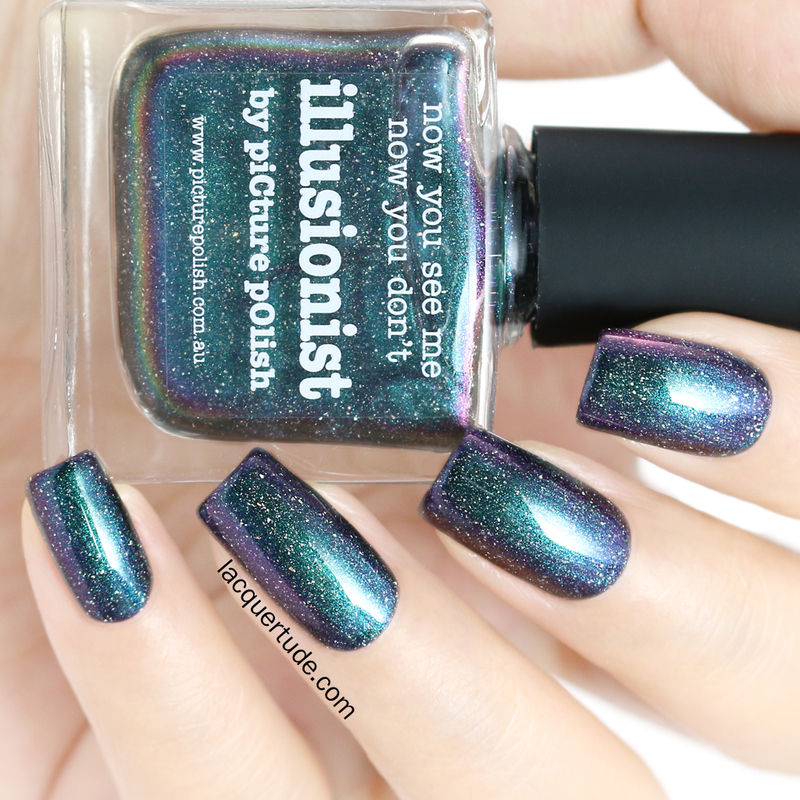 I love the signature piCture pOlish holographic particles in this shade, which adds to the depth and complexity of the overall look. 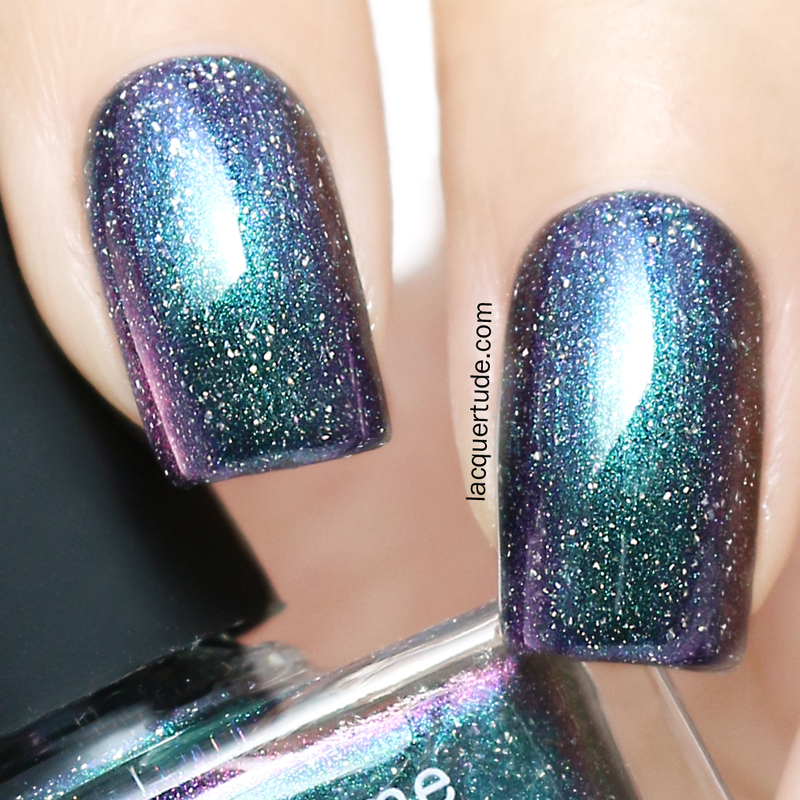 Another macro, it’s galaxy in a bottle…YUM! The purple base is simply to die for! So rich, so royal, so vibrant! Compared to Altered State, you can see that Gravity is much more blue leaning. I love the slate blue color that shifts into a pinkish purple. The macro really shows off how the holographic particles catches light and look as if they’re dancing in the multichromatic color base. The color swatch shows off the pink/purple shift on the left edge. 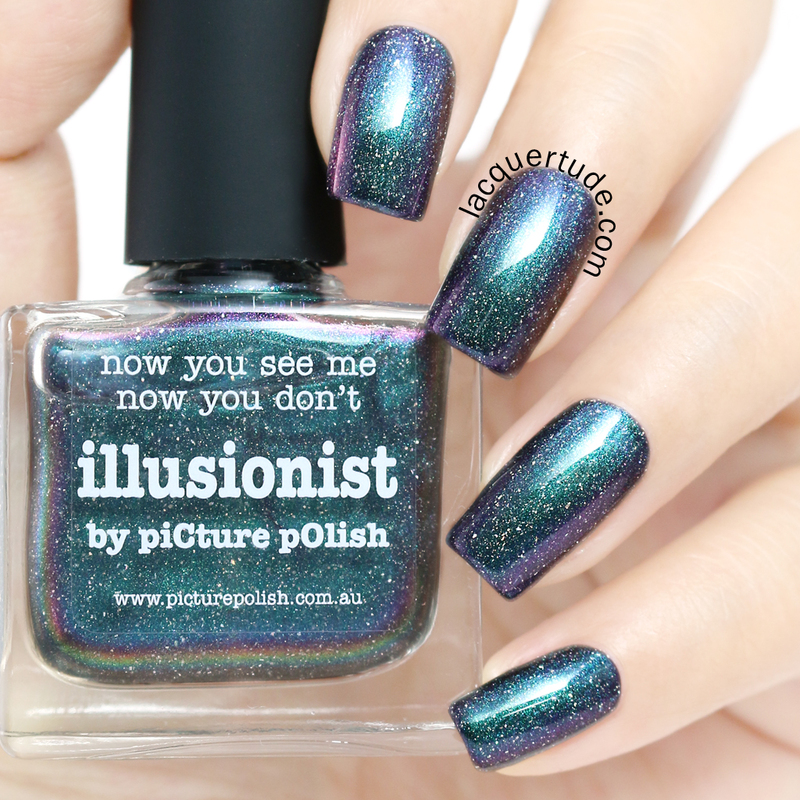 Illusionist is exactly as the name suggests. I can see blue, teal, green, pink, and purple, all flashing mysteriously in different lighting. It almost has a kaleidoscope effect..I can just stare, and stare, and stare…. 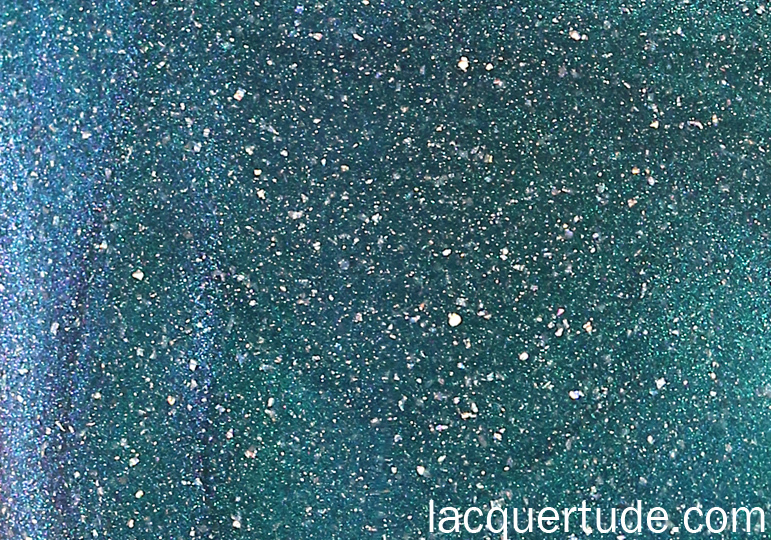 Look at the stunning shift from light blue to green to teal! Solar Flare at first looked like an odd ball in the bottles. But once I swatched it on my nails, I realized just how perfect it fits in this theme – we can’t forget the importance of the sun for mother Earth! This stunning shape shifter plays between red, yellow, orange, and a golden green! I think it really shows off the magnificence and deadly power of the sun. Another plus about this collection is that they have the new 5-free formula. So, on top of all the fantastical colors, you’re also getting a great formula that’s as healthy as true real nail polish can get without compromising the ease of your application! When these Limited Edition shades first came out, they were sold out in a flash (literally within minutes) on all online e-tailers. Due to unrivalled popular demand, piCture pOlish is restocking them this Monday, March 31st at 9:00AM Brisbane Australian time! They ship worldwide, so don’t miss out! I promise that you will NOT be disappointed by any of the 5 shades! And if you can splurge, then get all 5 and you’ll *SWOON*! Aurora is stunning. 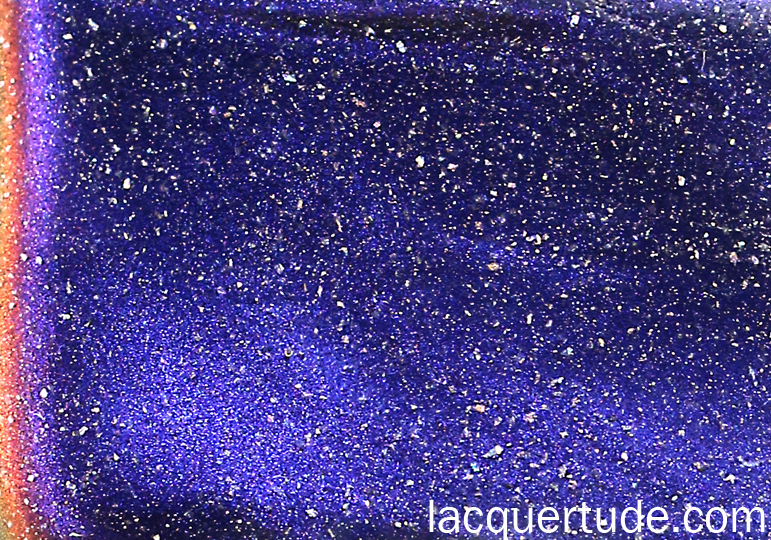 Do you know of a colour which is similar to it and still available? Your swatches are amazing as always! 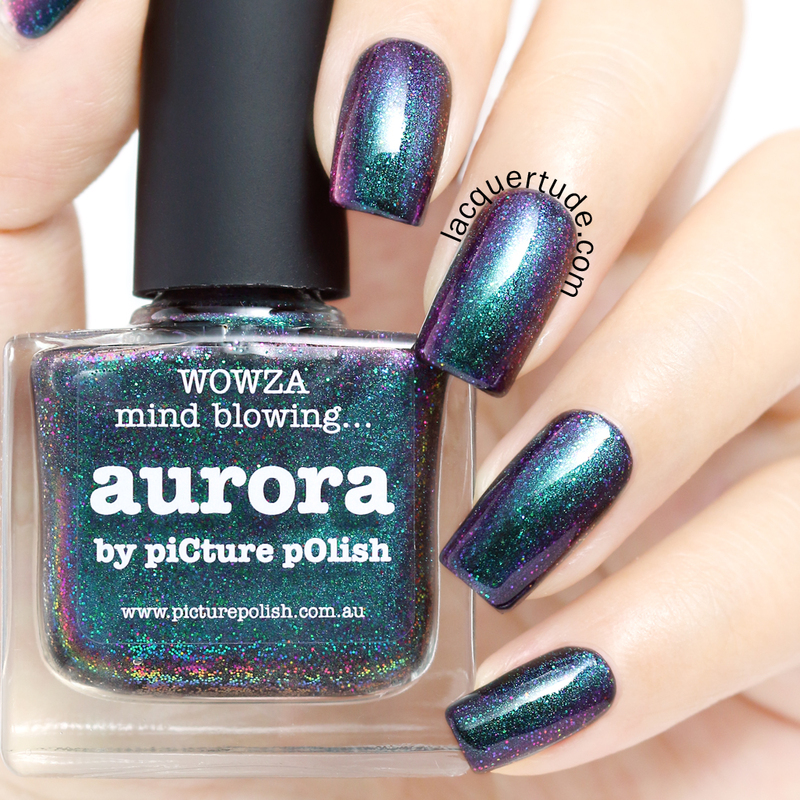 I have Aurora, and I absolutely love it! 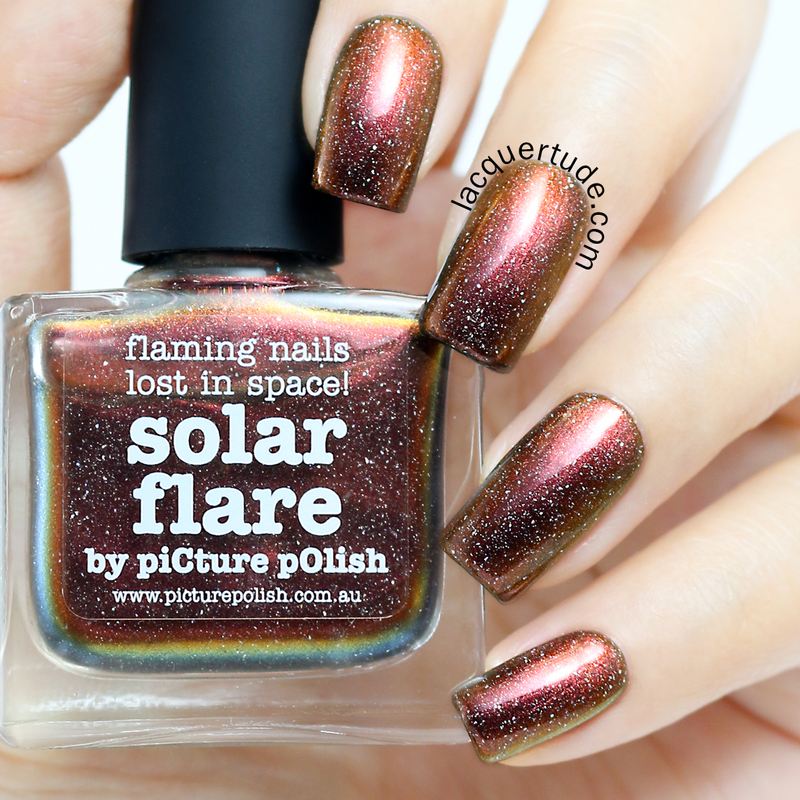 I have a real lemming for Solar Flare now though, I’m gonna have to grab that one! I had to use a cloth to tie up my jaw to keep it from dropping to the floor. Good grief, these polishes surpass even the ‘normal’ standard of beauty and excellence that is a Picture Polish! I must try to snag a couple of them when they get restocked. Simply breathtaking. Love them all. 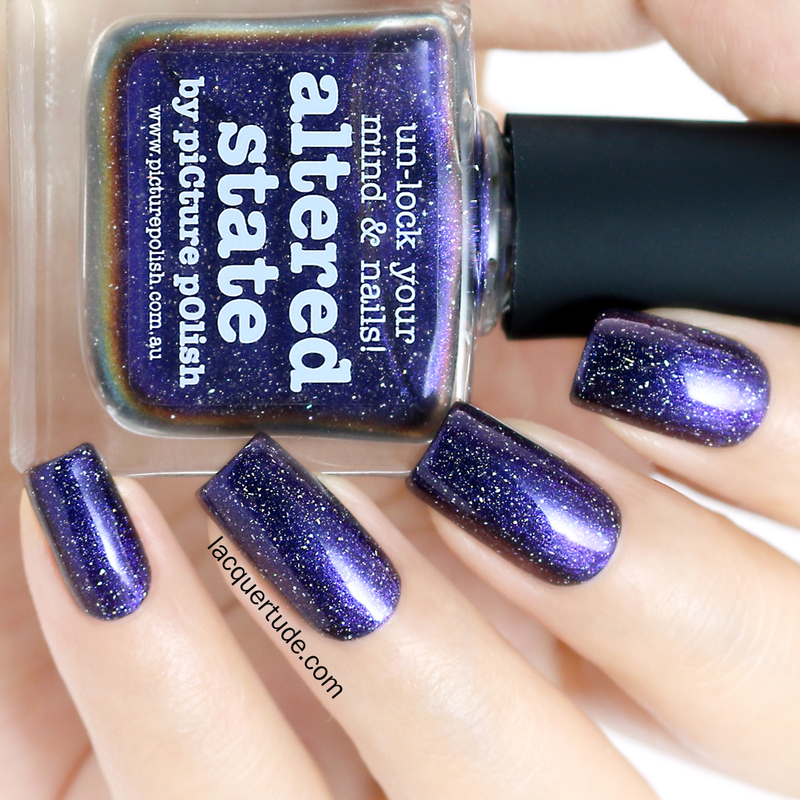 Altered State is eye catching. 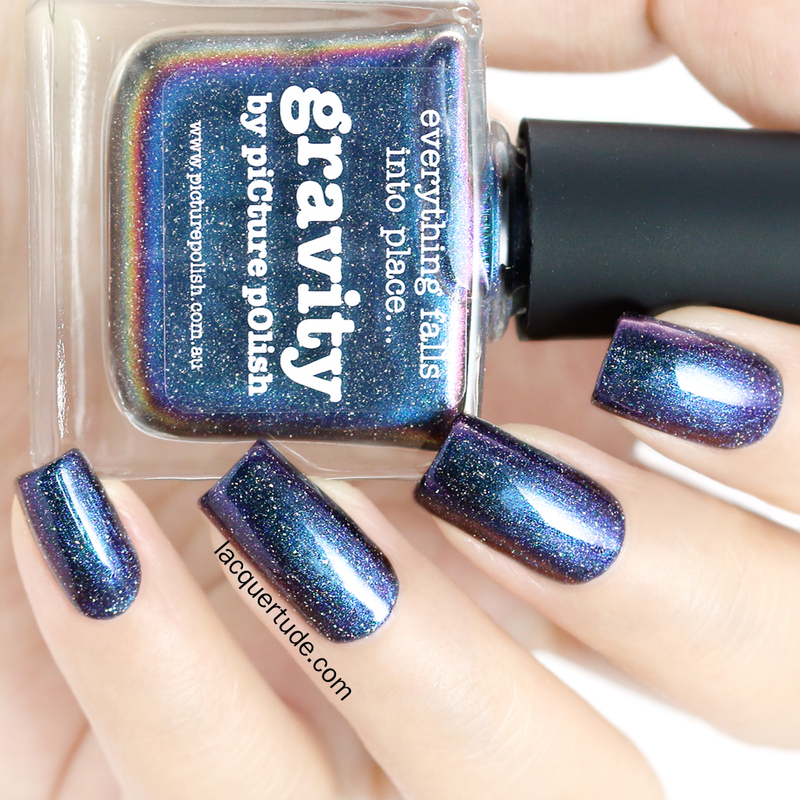 Gravity and Illusionist would have to be my favorites though. Great choices, Katherine! I love Gravity and Illusion too! I personally think I can’t really go without any of them!